Check out how many calories in Chef Salad with Dressing. Get answers to all your nutrition facts questions at FitClick. Description: Ham, turkey, egg, and vegetables over lettuce with Ranch dressing. 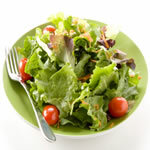 Tip: For nutritional information on all the ingredients in Chef Salad with Dressing just click on each ingredient name. Then adjust the serving size for any Chef Salad with Dressing ingredient with the serving size tool in the nutrition facts area to the right to see how you can save calories, carbs and more. Combine all ingredients in bowl. Top with salad dressing. Find more recipes like Chef Salad with Dressing. FitClick has over 60,000 foods and recipes with detailed nutrition information to view. can't have this salad for lunch it is just too many Preservatives! sodium and so many nitrates and preservatives. Lunchmeat is subpar protein.